With Hugo, Martin Scorsese tackles 3D, an adaptation of a beloved children's book by Brian Selznick, and his own deep love of and desire to preserve cinema, and weaves them together to create pure movie magic. Set in a wintry 1930s Paris of dreams, Hugo stars Asa Butterfield as the title character, Hugo Cabret. Orphaned by the death of his father Jude Law, Hugo lives illegally in the Paris train station, keeping the clocks running while avoiding being caught and sent to the orphanage by the Station Inspector, played with a cunning blend of humor and pathos by Sacha Baron Cohen. Hugo's father left behind a curious invention, an automaton which writes but needs a key to activate it. 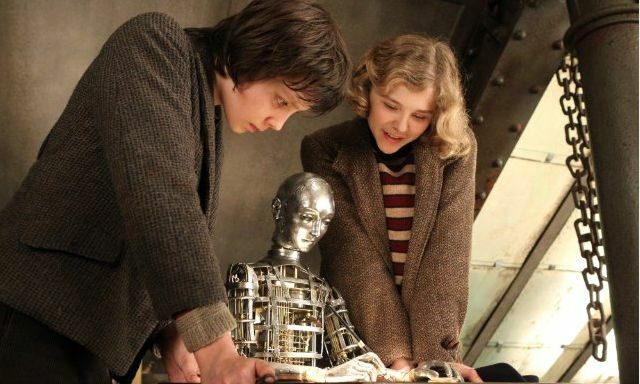 In order to unlock the automaton's secrets, Hugo befriends Isabelle, (Chloe Grace Moretz, neither a vampire nor a foul-mouthed, homicidal superhero this time around), the niece of the tragic George Méliès, played by Ben Kingsley. Though one becomes trained by years of Ben Kingsley as the villain in his films to expect Kingsley to be the villain of Hugo, Kingsley's gruff, haunted George Méliès is actually the great filmmaker, who directed hundreds of films at the turn of the century, most of which were lost or destroyed during World War I. His most famous work, Le Voyage Dans La Lune, was homaged in the 1990s by the Smashing Pumpkins for their music video "Tonight, Tonight". Scorsese's real message in Hugo is how important it is to honor and preserve the important cinema of the past for posterity, but he simultaneously directs a moving friendship between Hugo and Isabelle while even giving Cohen's Station Agent a sweet subplot of unrequited love with the station's flower girl Emily Mortimer. As a master of cinema honoring another master of cinema, Scorsese gives Méliès his just due while delivering a wondrous, timeless classic, utilizing the power of 3D better than most of his contemporaries. In Tracy Jordan's vernacular, I want to take Hugo behind the Paris train station and get it pregnant. Prime Minister Malcolm Turnbull says he makes no apologies panda shirt for his proposed foreign interference laws after China threatened a trade backlash.China's Ambassador to Australia has told the Australian newspaper that Beijing is concerned about 'systemic, irresponsible and negative remarks and comments about China' which he says have hurt the relationship with Australia.Speaking on a tour in Auckland, the Democratic presidential candidate urged us to take the rising superpower more funny mom shirts seriously.Australia and here in New Zealand experts are sounding the alarm about Chinese efforts to gain political power and influence policy decisions, she said.Brady of the University of Canterbury has rightly called this a new global battle, and it just savage t shirt getting started. We need to take it seriously. This year, Ms Brady said her home was broken into, and three laptops, two mobile phones and an encrypted memory stick from her last trip to China were taken.had a break in in my office last December.